A view of this year’s Antiques & Garden Show of Nashville. 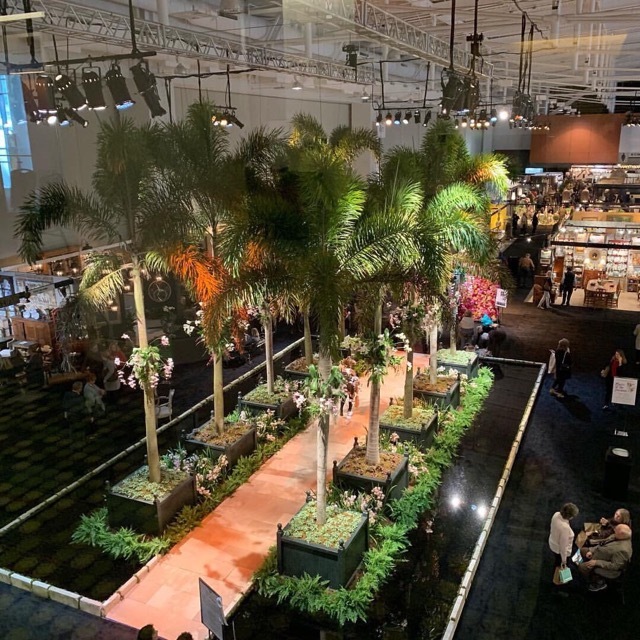 One of our favorite events each year is the Nashville Antiques & Garden Show for the romantic garden settings, the incredible antiques and the a-listers in the design industry who make it a point to attend each year. 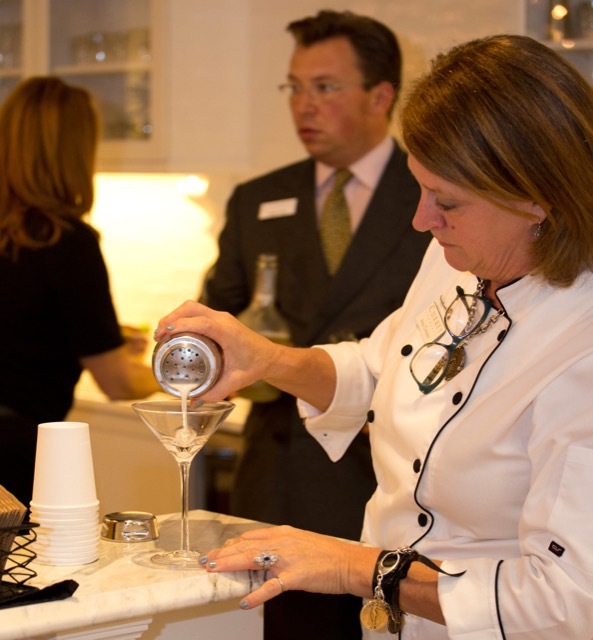 We have sponsored the early shopping event for several years and we always look forward to sipping bubbly with the eager antiques enthusiasts who want a peek at the wares before everyone else. With the 29thshow wrapping up several weeks ago, money was raised for two excellent organizations, Cheekwood Estate & Gardens and the Economic Club of Nashville. 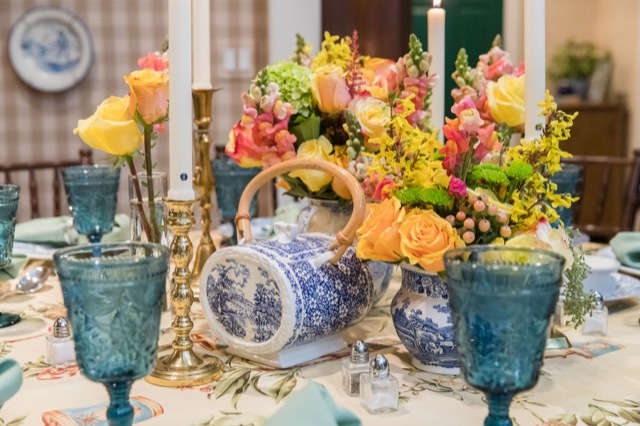 A beautiful tablescape created by Ruthann Ross at Boxwood Hill. Photo by Evin Krehbiel. We also experienced Nashville hospitality at its most luminous, hosting with Eric and Ruthann Ross a lovely dinner for the design community in their gracious home Boxwood Hill. You can see the transformation they’ve achieved by watching the series of before-and-after videos they’ve created, one of which we’re sharing below. It illustrates the metamorphosis the dining room, shown here at its most romantic, and the den have undergone thanks to Eric’s painstaking direction. 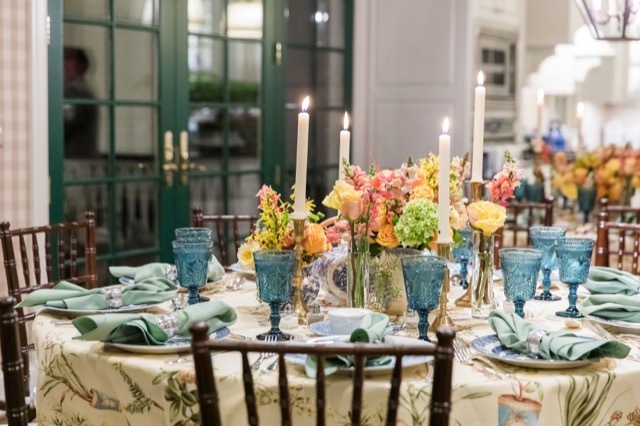 It wasn’t just the candlelight that made the home luminous that evening; the lush table settings Ruthann created shone in the flame-dappled spaces. 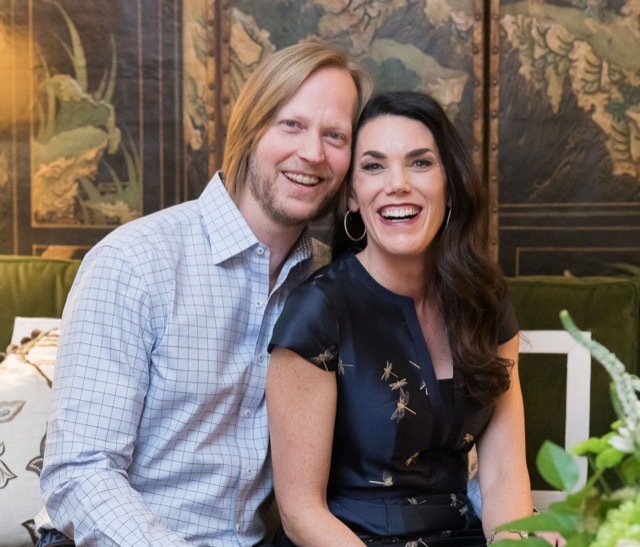 It’s as if the event was foreshadowing Valentine’s Day tomorrow, and not just because Boxwood Hill is the Ross’ latest labor of love, but because the show we were attending has been a Valentine’s tradition for Eric and Ruthann for years. Eric and Ruthann Ross in their Nashville home Boxwood Hill. Photo by Evin Krehbiel. The Ross’ blue and white dishes on the table at Boxwood Hill. Photo by Evin Krehbiel. 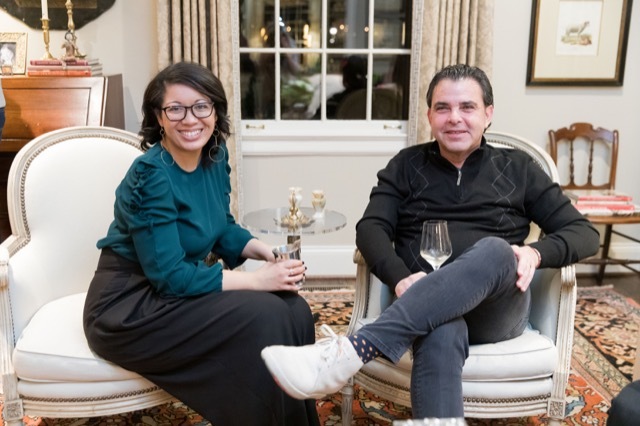 Design Influencer Conference founder Adam Japko with Tiffany Farney at the Ross’ home Boxwood Hill. Photo by Evin Krehbiel. This level of thoughtfulness contained within the book makes us eager to land a copy. But before we swing into action in High Point, we will be setting the stage (literally) at the Design Influencers Conference again this year. It’s back in Atlanta after several years in California, taking place at the Grand Hyatt in Buckhead from February 24 through 26. Have you registered to attend yet? 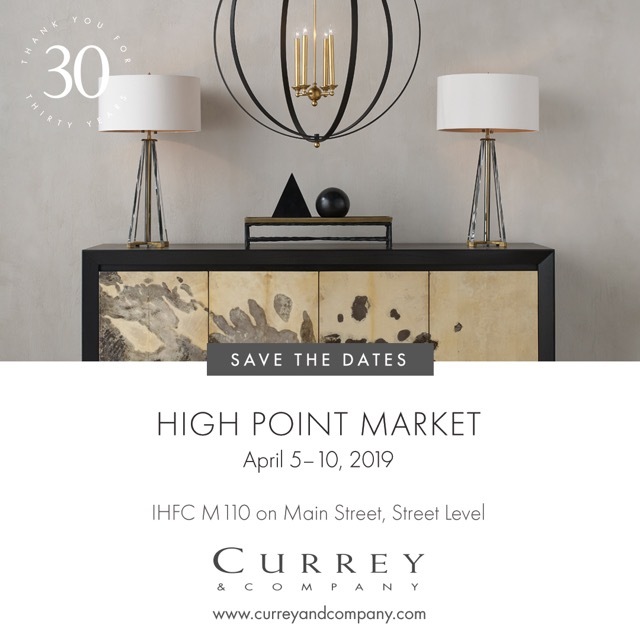 Along with sharing the new products we’ll be debuting and flaunting our entertaining ways during High Point, we will be strengthening an initiative we’ve been instituting behind the scenes that may not be obvious to everyone. 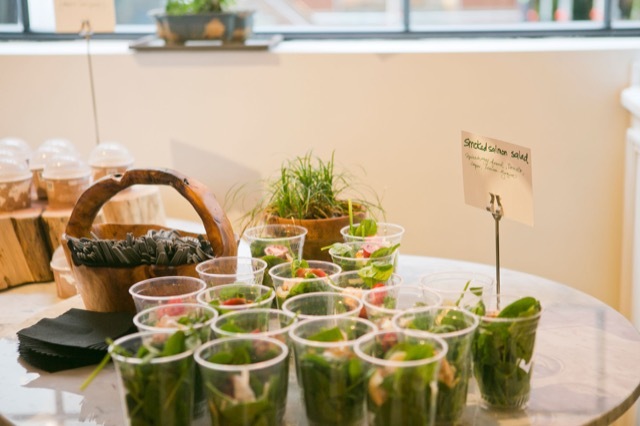 Our caterer Anna Thrower of G. Anna, Inc, has been transitioning as much of our dishware as possible to products that are made from recycled material, as well as recycling as much as possible. She’s been sleuthing dishes that are plant-based, such as plates made from sugar cane and utensils made from wheat stem. Even her chic chef’s coats are made of plant-based materials. Anna Thrower intent upon making people happy during High Point Market. 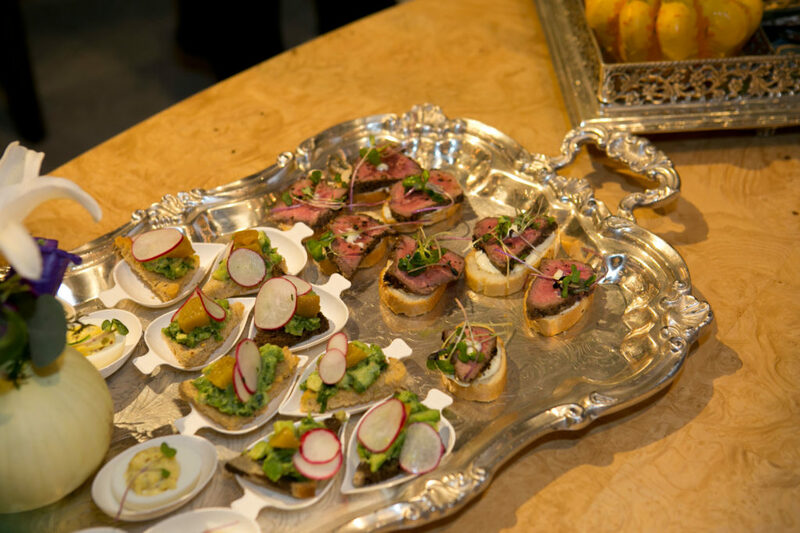 Entertaining in the Currey & Company showroom is becoming more sustainable. 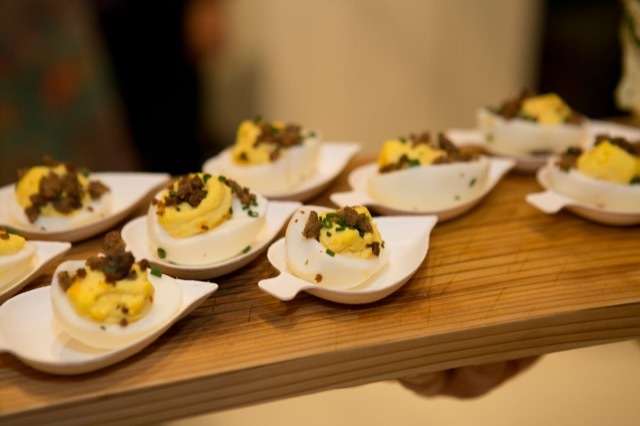 Deviled eggs served on little biodegradable dishes shaped like leaves. Anna’s passion for sustainability echoes our own. Though the transition has been a challenging one because finding aesthetically pleasing dishes that are durable enough to hold up to the demands of a broad menu, we are managing to rid our showroom of plastics bit-by-bit. We just thought you might want to know, because when you see our lovely (and yummy) morsels being paraded around the showroom or when you reach for one of our salads made from produce just picked at Elm Street Gardens, know that we are thinking of beauty, flavor and what’s good for the earth. Smoked Salmon Salad made with locally sourced ingredients. “The Romantic Backstory” was written by Saxon Henry, a content strategist and The Modern Salonnière. This entry was posted in Currey & Company, Entertaining, News and tagged book signing, Company Happenings, design influencers, Floral, Garden, tabletop on February 13, 2019 by Saxon Henry. Thank you for this fabulous recap of our party, our home and Eric’s New Book. Always a treat to partner with Currey and Company in any capacity! 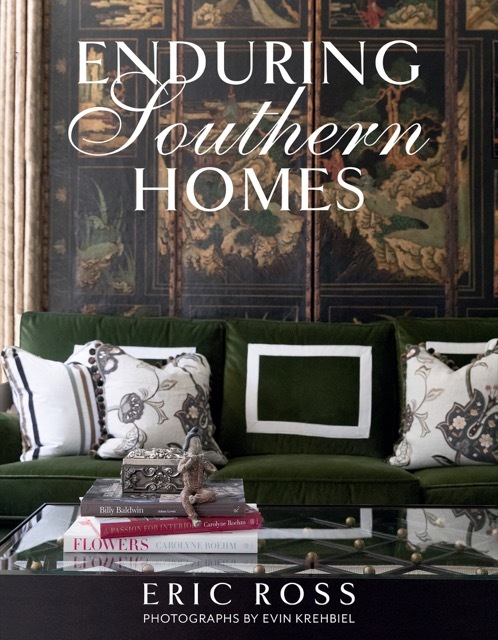 We can’t wait for the book signing, and congratulations on such a beautiful home and event. Thanks for taking the time to comment!